SEBI has increased Futures & Options lot sizes from November. Need min. margin to the tune of 75k-1L. How to trade derivative in such scenario? Create source of regular income with Options Trading. First time in Nashik "Revolutionary Options Strategy its so Powerful "- 2 days Options Course. Nifty may trade in a range of 7800-8200 with negative bias in coming week. Short Term (Few days to a Week) : This market is sell on rise market. Sell Nifty on rise near 8225. Medium Term (Few weeks to a month): View remains same here. Medium term traders wait patiently for Nifty to calm down. Long Term view on markets (Few months to Year): After long I am elaborating this section in the newsletter. Well do we say Nifty is in long term downtrend? I have this view: Wait patiently for some more time for Nifty to give us clear indications. So far it does not seem to be anything like downtrend here. This can be seen as opportunity to buy value share for long term. However markets may not immediately move up now. Further downside though possible, may not be substantial. There is not hurry for buying value shares too. Markets can correct further a bit. So wait patiently for them to give us signals then one can start buying. What #type of #trader you are? Most beginners do not understand what type of trader they are. Yes I mean it. Lets understand the 'type of tradings' first. One can be a "Intra-day Trader" or a 'Swing Trader' or a 'Positional Trader'. This is how it is defined in books. But there is 'more to that'. Intra-day trader: One who begins and completes his trade in one trading day. Note: The time frames mentioned above has no formula....it can vary somewhat. Lets come back to 'more to that'. I wish to refer to thinking pattern of an individuals. Everyone thinks differently. Everyone has different personality traits. Hence within above trading styles there can be many types that an individual can develop or use as advisory. Lets take an example: Lets say I am a Swing trader. But my Risk Appetite is low as I am a conservative thinker as compared to 'some other trader' who's Risk Appetite is high as he is a aggressive thinker. Hence within Swing trading I shall trade with strategies that will earn me comparatively safer returns than 'some other trader' with lesser 'returns' expectations say 3-4% a month. However 'some other trader' will trade with aggressive strategies that can earn him 6-10% a month with higher amount of risk. Trading type also depend on other factors like availability of Margin Money, availability of time etc. Before beginning (or even you are an existing traders) your trading journey spend some time in understanding how your really want to go ahead. I always ask my subscribers and to my students to decide what kind of trader they want to be. If they can not decide on their own I counsel them on that part. Personal counselling on phone/skype/ personal meeting is free for my Advisory Subscribers and Students. Among my Advisory Products, I have products for different traders personality traits. For example if One want to be conservative but has sufficient amount of investment to deploy as trading capital I refer him to my "Prime Options" advisory product. If one want to be little aggressive, has lesser capital to deploy and still want higher returns....I refer him to my "Prime Futures" product. Give it a thought before actually starting your journey. If you want to get yourself counselled on your trading style -put your details like email and contact number in comment below. This will be free of charge but only through mail communication. SGX Nifty suggesting gap up opening today. For the time being we expect NIfty to have formed intermediate bottom near 7600. Be on long Side (buyer) for next 2-3 Trading sessions. One has to be cautious as Nifty can re-test the bottoms near 7600-7700/once this rally is over. 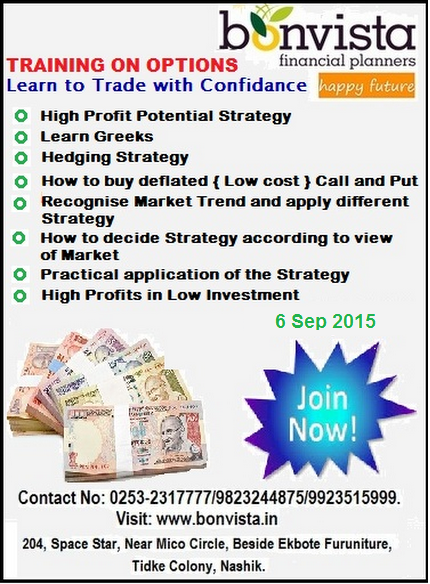 Traders Training On Options Batch 6 Sep 2015. Booked profit of 56% in GHCL on 10-AUG-2015. GHCL BUY Recommendation is from our Prime Cash Portfolio. We had Recommended delivery buy on 8-july-2015. 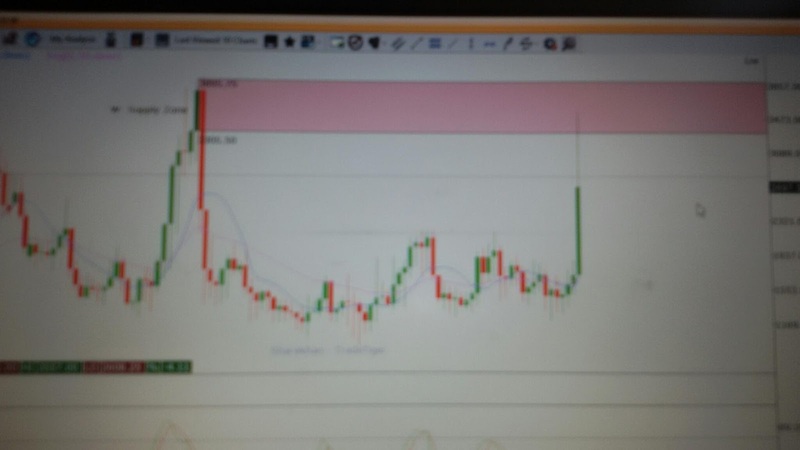 Booked profit of 56% on 10-AUG-2015. India VIX weekly chart India VIX has fallen sharply from its top of 3557. Is this start of new rally in Indian markets? Note: India VIX is volatility Index which falls when Markets are stable and moving up. Markets mayhem yesterday. Most investors / Traders are frightened. 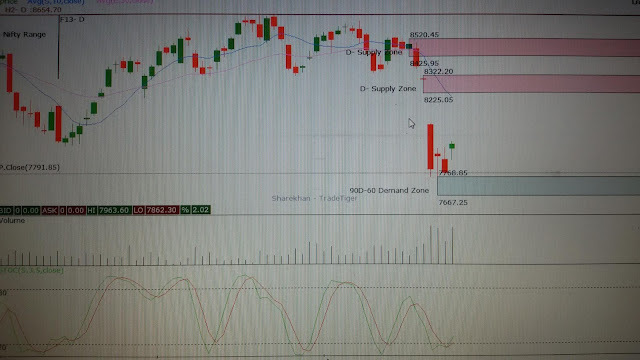 Technically, Nifty daily chart has gap at 7819. Low of this gap is at 7723. We have this level as intermediate support. SGX Nifty indicating gap up opening by almost 100-150 points as at 7.45 am. This is an opportunity of exits for those who's positions are stucked. Question is whether one should buy this expected gap up. The answer is NO. Wait for the Markets to stabilize. There will be many buying opportunities in days to come. So relax. Because of FNO expiry, Markets can see Short unwinding which can take Markets up. Very short term Traders /intraday traders can see this as Trading opportunity. I have a student of mine who has traded the markets for last 7 years now.....lost most of his assets.....thats ok.....the irony is- he was still dreaming of making 5-7% per day in intra-day trading. He wanted to double his money in couple of months. Don't you think for making money, as a trader, we will have to learn 'not loosing'. The fact is most traders earn small sums of 4-5 trades and then one huge loss making trade to blow up their account. This where the problem is. Out of all above scenario- as a trader I wish to avoid only scenario 5. All other scenario are welcome. There are many techniques for Risk Management (More on this later). I teach all these techniques in my course. The aim is to make traders learn to avoid losses and then make them learn make profits. Nifty gave up to global selling pressures. Rupee depreciation added to the fear. 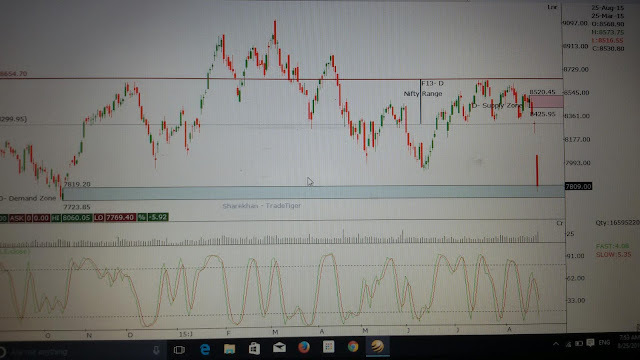 Nifty broke below the range which was mentioned in this post last week. Markets are entering in FNO expiry week. What next? 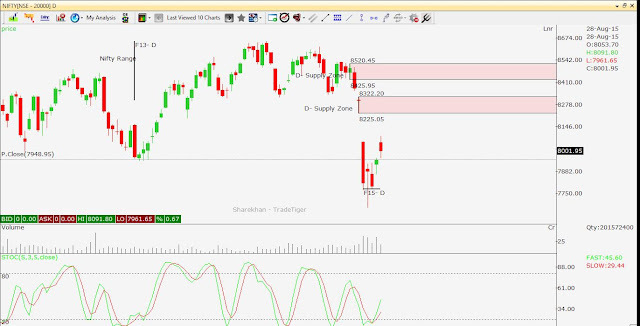 Technical Overview: Last week Nifty made high of 8530 and low of 8225. A range of 305 points. On weekly chart Nifty closed with big red candle. 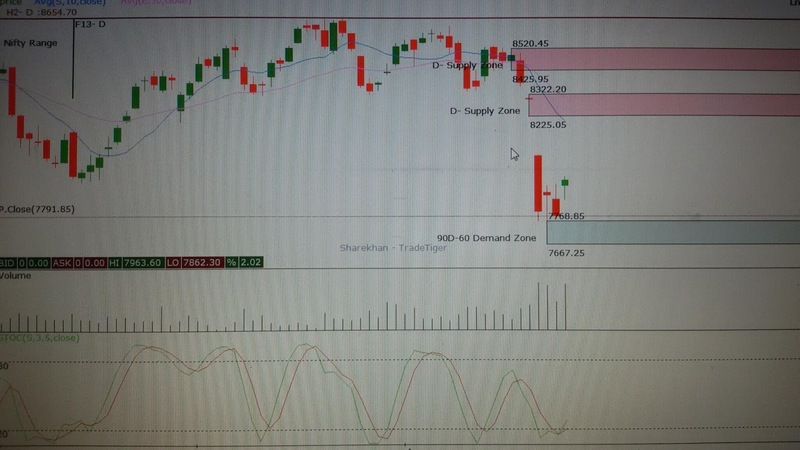 Nifty broke crucial lower range of 8300 and closed below this level. Since there is F&O expiry in coming week we can experience choppy market conditions. Short unwinding can take markets to higher level. However this will purely be a pullback in current down-move. 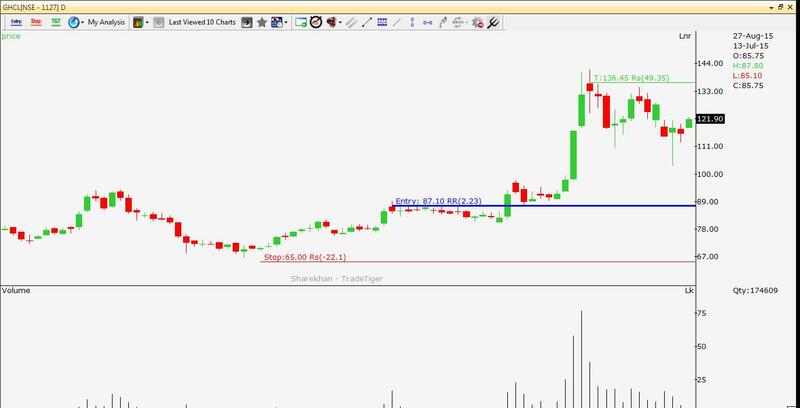 The upward range can be till next resistance at 8425-8520. I feel markets are in intermediate downtrend. Though a small upward move on account of short unwinding can come through. This downtrend is expected to remain intact till Nifty cross 8650. This downtrend has may take Nifty to next support level of 8125. Lower end of this support range is at 7940. Short Term (Few days to a Week) : Aggressive traders can buy Nifty at current level for target of 8350. Stoploss at 8232. Medium Term (Few weeks to a month): Medium term traders wait patiently for Nifty to calm down. Long Term (Few months to Year): Nifty remains in bull market so far. Bank Nifty: Same view as that of Nifty here. Short undwinding may BankNifty to rise by 200-300 points. However this may not come as a straight move. At-least going short at this level is not suggested though BankNifty is in intermediate downtrend. CNX IT: Among all indices IT index is different. This index has just took a pause in ongoing uptrend. One can remain on long side in selected IT stocks. Is Technical Analysis worth spending time? Traders Training On Options Batch 22&23 Aug 2015. Booked profit of 9000 in TATASTEEL Buy Call. #Nifty #Banknifty moving down or up? Booked profit of 14425 in APOLLOHOSP Buy Call.